In numerology, 89 is considered an “angle number” and that, “Repeating Angel Number 89 can be a message about your lifestyle and career choices and the angels guide and support you as you focus on your life purpose.” While that’s a bunch of hooey, what’s anything but malarkey is that Fred Eckhardt‘s upcoming 89th birthday party, aka Fred Fest 2015, is possibly the very best beer celebration we have here in Portland, and I’m aware I’m saying this as CBC is only halfway through. Tickets go on sale tomorrow for the party on Sunday, May 3 at, as always, Hair of the Dog Brewing. Attendees will be treated not only to a rare assortment of hand-selected beers, but also light fare cooked in and with beer and of course birthday cake and a round of “Happy Birthday”, just for Fred. Cheeses, chocolate, candy and even cereal will be offered in abundance so attendees can experience some of Fred’s famed beer-and-food pairings. Tickets are in advance. 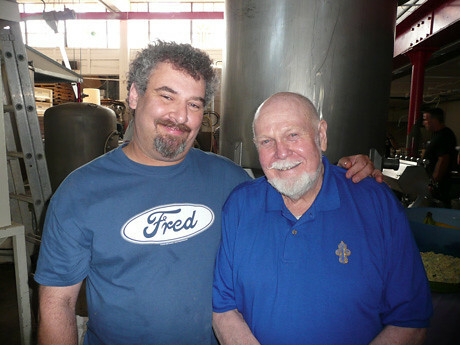 Entry into FredFest includes a souvenir glass, free ticket for a raffle of bottled specialty beers and four hours of sampling, sipping and story-telling with Fred. Tickets are limited and they will go fast (they’ve sold out every year to date), so order yours today before it’s too late! Don’t have a PayPal account? Follow the link to “Order Tickets” and you can still pay directly with a credit card. Tickets are not mailed out, they will be at the door will-call style. Please bring a copy of your PayPal purchase receipt with you. Make sure if you are purchasing the tickets for a friend that you include their name in the notes section so we can get all ticket holders into the event quickly. As always, all proceeds from FredFest and any related auctions/raffles will go to a charity of Fred’s choice. The 2014 recipients chosen by Fred are the Guide Dogs for the Blind, International Medical Corps, and the Bob McCracken Scholarship Fund.